You may have started to think I have abandoned my non-league roots, what with all this Chester, Bury and now Crewe malarkey. Old Trafford a month ago? What has become of me? Clearly my patronage of Gigg Lane and such means I am edging towards the prawn sandwiches and away from the pie and peas. Well, not just yet any way. My original pick for today was the exceedingly proletarian Kidsgrove Athletic v Willenhall Town in Unibond Division 1, but a phone call ahead to the ground told me the game was off. I assumed rain, as I couldn’t really hear the guy on the other end. It was only after I’d proffered a cheery ‘Oh well then, fair enough’ and put down the phone that I realised what he might have said was that someone had died, causing the postponement. A gnawing at my knuckle moment, for sure. 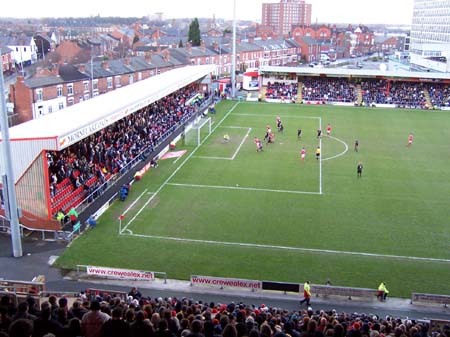 Still Crewe was a change point and Gresty Road is new to me and right slap bang next to the station, hence the nickname the Railwaymen. I had a couple of hours to kill so I happened on a bar advertising itself as for Wigan fans and with free chip butties between 12:30 and 2. It was 1pm. Score. Putting on my best Lancashire accent, I settled in front of the big screen showing Everton v Chelsea and plonked myself next to the table where the chips and bread were being slung. After a while newer punters began to think all the chips were mine, rather than an example of socialism in action, and I’m sad to say, comrades, that I had more than was possibly my fair share. Particularly for an impostor. Ah, the benefits of neutrality, and being a merciless blaggart. 17 notes is more than I’d usually care to pay for a game, I could probably watch Kidsgrove about three times for that, not that that is on the agenda. Once will do, and assuming no-one else stiffs (although checking the Kidsgrove site, it appears my worries were unfounded and, clearly, my deafness is becoming more profound). However Crewe’s family club image has always appealed to me. The club that creates so many talents but is always resigned to having to sell them, a kind of feeder club for the good of English football in general. They are aware of their limitations and that the Championship is the best they can expect and, indeed, have probably surpassed expectation by achieving relative stability at that level. The football they play, the players they produce and (NICKNAME BASED PUN WARNING) achieving these dreams beyond their station are the reasons that they have the longest serving manager in professional football, and possibly the only one to have a Top Ten dance act named after them, Dario Gradi (i.e. Dario G for those who don't follow the Tip Top 40 charse). Wouldn’t work quite so well with Stan Ternant, I guess. Dario, after 21 years, isn’t the longest serving manager in all of senior English football though, fact fans, as one of my local non-league clubs here on Merseyside, Marine of the Unibond Northern Premier, have been under the command of Roly Howard for the best part of a third of a century. The other thing people know about Roly Howard is that he is, by trade, a window cleaner, and counts Mark Lawrenson among his customers. Spit in the bucket, Roly. For me? Again, though, I veer dramatically off-topic. 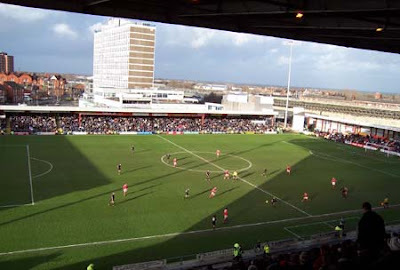 As I say I like Crewe, they seem a patient bunch that have been given a better ride than they could have imagined, in a nice ground brought up to the 21st century with a gigantic main stand that towers over the three older structures. They seem the kind of fans who would be too polite to boo their own players, the type of crowd you’d like to take home to meet your mother, in essence. Today though they must have been sorely tempted as Dario’s charges had patches when they appeared totally hapless in the face of an exciting Wigan team that certainly looked the part and still within touching distance of a first season in the Premier League. If this were so, it would come only 27 years after being elected to the league itself – ok, so it’s not a Wimbledon-like meteoric rise, but still pretty good I reckons). Wigan certainly didn’t look as though they needed help but their first goal came very easily in the opening exchanges and after this Crewe seemed incapable of the passing football they are known for, delivering the ball mostly to their opponents. If I didn’t trust English football so, I’d smell a cut of Hansie action. Things improve as the half goes on, climaxing with an equaliser right on half-time, with a spillage from the keeper leaving an out-stretched Crewe foot to finish the job. Indeed, Crewe looked of much greater spirit at the beginning of the second period, but it was to be a controversial incident that changed the game. Racing into the area, a Wigan player went down like a sack a’ shite after taking a few steps post-challenge to make sure of getting in the box, and Nathan Ellington calmly stepped up to slot away the spot-kick. Crewe fans took out their profound indignation on the challenged player by booing his every touch from then on, but inside though, you could tell they thought they might go to hell for being so beastly. After that though it was back to Crewe defending as though accompanied by the ‘Catch the Pigeon’ theme, and when put through, Wigan’s Jason Roberts was given a chance a striker of his calibre just doesn’t miss. He lived up to the billing and put the game out of Crewe’s reach and kept Wigan dreaming of automatic promotion. I’m in no doubt that Crewe are better than this display would suggest, but for the 90minutes this afternoon, 3-1 was as ideal a result as depiction of proceedings as they come.